PileLink is a pile data management program, which encourages a standard approach to manage pile data and exchange data between project management, pile installation and pile monitoring companies. PileLink provides us with the ease of use of a graphical interface by combining the power of spread sheet and hardware graphics acceleration. The highly flexible data input and intuitive graphical visualization make PileLink an ideal tool for piling project progress monitoring and quality control. PileLink is released under a Freeware License. You can download and use it for free for any purposes for an unlimited period of time. Whole site big picture presentation. Whole site piles layout can be viewed within a computer screen. Large data set handling. It can handle a large number of piles so that it can easily work on large projects. Dynamical pile state change. Pile state and related pile data can be updated at anytime. Installation progress visualization. It visualizes pile installation progress so that project progress can be easily monitored and quickly reported. Data exchange between different parties. Project management, pile installation and consulting companies will benefit from its easy data exchange and consistency checking. Distance-between-piles query. Distance query is very useful for consulting company to accept piles based on re-strikes or PDA tests. Easy and fast pile data query. Users can find a specific pile by Find dialog. It is just a click away. Dynamic pile label change. Pile labels can be switched on and off, and can be changed to another column of data as well. Zoom in and zoom out. Zoom in and zoom out give users the flexibility to view any interested areas. Data view in different modes. Hollow, filled circle or point modes meet requirements in difference situations. Spread sheet style data input. Data input within spread sheet greatly simplifies user interface. Simple Excel data exchange. Simply copy and paste data from and to Excel-like spread sheet software. Data structure customization. Columns and their data types can be customized. External file management. External files can be linked to any pile. * PileLink download link provides freeware version of the software. 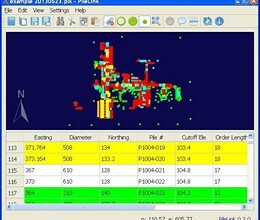 PyPile is a free lateral pile analysis software program based on p-y curves. Pile deflection, bending moment and shear force will be analyzed with different load cases. SoilStats provides an intuitive way to analyze gINT geotechnical borehole logs. Software to digitize data from graphs for Engineering design calculations and analysis. PileLink has been rated 4.0 out of 5 points. A total of 2 votes cast and 0 users reviewed the software.